Fifty years ago, he set out on a mission with Lord Mountbatten, the man given the difficult task of burying the British Empire in India. 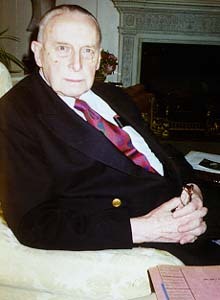 Alan Campbell-Johnson, the last viceroy's press attache, is one of the few surviving eyewitnesses to history, those tumultous months when India became free. At his tastefully decorated apartment on Ambrosden Avenue, near Westminster Cathedral in central London, Campbell-Johnson, who will be 84 in July, spoke to Amberish K Diwanji about Partition, Gandhi, Nehru and Patel. The Independence of India was unique, it was a battle fought on the principles of non-violence, led by a man whom many today consider a saint, Mahatma Gandhi. Yet, what was largely a peaceful struggle for Independence, ended in brutal bloodshed as the the new nation was divided into two countries along religious lines. Hundreds of thousands died as millions migrated eastwards or westwards, depending upon their faith. There was bewilderment that the British, who ran undivided India like clockwork, could not control the horrific violence. Fingers were pointed at London for its callousness, but more specifically at the man in charge, Lord Mountbatten, for trying to rush things and thereby causing bloodshed. Campbell-Johnson strongly disagrees. "We did not leave too early. Even the slightest delay would mean leaving too late. When Mountbatten accepted the assignment, the tentative date set was June 1948. But on reaching India in March 1947, he found that 1948 was too far, it would have to be the same year, the sooner the better. Delays would have caused greater mayhem, not less." 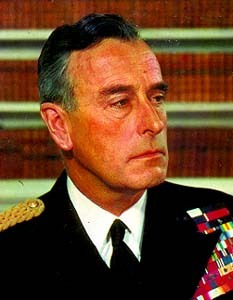 "Many of Mountbatten's critics do not understand that Mountbatten's task was a political one, not administrative. His job was to find a solution to the transfer of power. And once a political settlement had been reached, the administrative consequences became clear," he continues. Certainly a statement that not many would agree with. The British could have stayed a little longer, acted more firmly in putting down violence, surely? "How could you do that?" questions Campbell-Johnson. "Within hours of reaching the the political settlement on June 3, 1947, the interim government virtually collapsed. What on earth was Liaquat Ali Khan going to do as finance minister in the cabinet with Jawaharlal Nehru as prime minister? So you would have to govern India under Section 93 imposing martial law. How could you govern a country on the verge of Independence under martial law?" From June 3 to August 15 was just 73 days. Perhaps more time would have given the people time to come to terms with their new nations and move across in a more peaceful method. Campbell-Johnson dismisses the suggestion. "Once Partition was accepted, including the partition of the Punjab state, the Sikhs were in total revolt. We were dealing with a situation where we feared a collapse of law and order across the subcontinent. More delays only meant more trouble. We ensured that the violence overall affected only 3 per cent of the country." The Sikhs were also the ones who suffered and lost the most, their political leadership in disarray. "Their own situation in the state was such that they simply would not accept the agreement. But what other option did they have? If they had asked for sovereignty, it would have been refused by both India and Pakistan." Campbell-Johnson recalls the meeting between the then governor of the Punjab and Mounbatten, when the viceroy was told that partitioning Punjab would lead to trouble. "Mountbatten replied that he had to think of the whole country when making a decision," said Campbell-Johnson. However, that is little consolation for those hurt, and the hundreds of thousands who died. Campbell-Johnson adds a caveat on the number of dead. "Claims have been made that about 500,000 people died during Partition. It was nothing of that sort. I was part of the Emergency Committee set up to monitor the situation, and let me say here that most of the violence took place in a period of two and a half months, during which time about 200,000 people were killed. There are noted historians who agree with the same figure." Campbell-Johnson feels, and most Indians would agree, that the situation began to deteriorate after the British accepted the communal electorate system. "You are justified in asking how such a scenario was allowed to develop in the first place. It was a crisis in the making for five years, even longer. For this, everyone was responsible to some measure: the British administration before the war, the Congress during the war, and the Muslim League after the war."